America has Route 66, Scotland has the North Coast 500. The route around the north of Scotland comprises 516 miles of stunning highland scenery, open coastal roads, lochs, mountains and glens. River & Green are offering our clients the opportunity to take on the North Coast 500 in combination with some of the finest country sports Scotland has to offer. As well as enjoying the incredible coastal and highland scenery you will have the opportunity to play golf on the historic course at Nairn, fish for salmon on the River Ness, stalk red deer stags in the wilderness around Loch Inver and hunt woodcock on the Applecross peninsula amongst many other opportunities. See the map below for more suggestions for activities along the way or contact us today for a detailed itinerary. 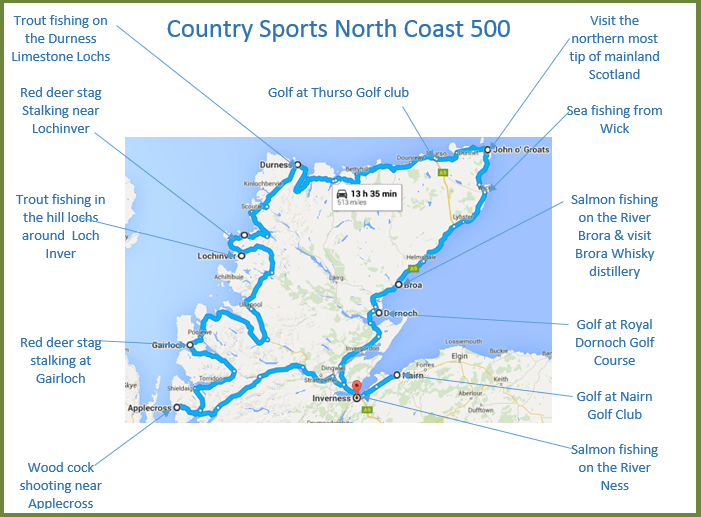 River & Green’s holidays in Scotland are tailored to each individual client so our country sports North Coast 500 has something to offer everyone. The route can take anywhere from 3 days to 2 – 3 weeks to complete depending on what sort of trip you have in mind. If you are only interested in the scenery then you can complete the circuit over a long weekend or alternatively River & Green can arrange any combination of hunting, deer stalking, fishing, golf and other activities over a longer period depending on your preference. The map above is purely for inspiration, there are many variations on the North Coast 500 that can be done. In the recent past we have had clients embark on a “Gourmet North Coast 500”, a “Hiking North Coast 500” and a “Photography North Coast 500” as well as our specialist Country Sports North Coast 500. Let us know what you dream trip would include and we will tailor a package just for you. Please feel free to contact us at any time for more details about the Country Sports North Coast 500 or for any enquiries regarding tours of Scotland or hunting, shooting , fishing and golf in Scotland.